This chapter is still incomplete, but slowly growing. However, language is not only a means for expressing things, but can itself become the object of study, and while speaking is a kind of action, it is a very special kind of action. However, when we start to consider examples, it soon turns out that the situation is not always that simple. Many names were originally descriptions. Simple examples are family names, many of which derive from a feature of the landscape -- "Tanaka" in Japanese is the same as the English "Middlefield" -- or from professions: "Müller" in German is an even more common surname than "Miller" is in English. Less obviously, most given names have meanings too, which can be more or less obvious: the Turkish name "Murad" means "wish", but "Richard" also comes from "good with the spear". In your group, check who knows what their names mean, or where they come from. For which of the two shapes shown on the right would you choose the name "malumo", and which one would you call "taketa"? Do all the members of the group agree? Amongst adult speakers (at least of Western-European languages) there is apparently a great deal of conformity in the choice, but that general agreement only develops gradually, between the ages of 4 and 16. 4- and 5-year olds are almost as likely to choose one name as the other for each of these figures. Peter R. Hofstätter, ed., Fischer Lexikon: Psychologie, 1957. Think of other examples where a thing has more than one name, such as a person or a country. What name should be used for Uluru, or Ayer's Rock, on a map? Should there be only one name? What is the purpose of a name? Does it matter which of the two names a speaker uses? Does it say anything about the speaker which name he uses? From the last Exercise we have to conclude that the meaning of a name can have different aspects. The purpose of a name may be to identify an object (in the widest sense, including a person, and so on,) or a kind of object, but at the same time a name can carry all kinds of further significance. These two aspects are called denotation and connotation: the denotation of a name is the object that it refers to, the connotations are further implications that the use of the name has, including implications about the speaker. as a 'guru of the Left': from an outspoken opponent to the US involvement in Vietnam, Chomsky has become the best-known 'alternative intellectual'. Starting in the early 19th century, the explorers who travelled all over the world not only brought back specimens of butterflies and reports of all kinds of wonders, they also 'collected' exotic cultures and strange languages. And in the first half of the 20th century, as it became clear that many American Indian languages were about to disappear completely, there was a school of academics (Bloomfield) who did a great deal of research and tried to preserve the evidence for posterity. (It should be clear what categories the letters stand for.) To avoid having to mention hte meaning of words, the categories were established by patterns of co-occurence: since "window" and "toy" can occur in similar places in sentences, they belong to the same grammatical category. Give three examples which fit the sentence formula T N v V.
Using the same four categories, construct another sentence formula, and give three examples of sentences that fit that formula. Now, using Q for a question word as well, construct another sentence formula. Convert your three examples in b. into sentences which fit this formula. It may be easy to make a rule for passivisation for a simple sentence like: "Joe sees Paul." But that rule have to be amended for: "Joe sees Paul and Thomas." And again for: "Joe sees Paul and Thomas was there." "Sartre expressed his views on television." "His views were expressed by Sartre on television." "His views on television were expressed by Sartre." "Frank is easy/ eager to please." "It is easy/ *eager to please Frank." "Frank is *easy/ eager to please someone." The two sentences in each pair have the same superficial structure. Try to think of grammatical changes that suit one sentence in the pair but not the other. "Morten and Ole are Scandinavians." / "Morten and Ole are friends." "Miriam and Semira are similar." / "Miriam and Semira are happy." "A boy is outside." and "There is a boy outside." "Murdering peasants can be dangerous." A good theory of grammar, just like a good theory in physics, should enable us to make predictions for a wide range of observations from a small number of principles. But who are the native speakers whose judgments are to be accepted as evidence? Chomsky and his school took the (at the time) radical step of accepting that any dialect has its own grammar. It turns out that the grammars of non-standard versions of a language are as regular and no simpler than the grammar of 'the standard language'. The distinction between a 'high language' – such as the Queen's English or Hochdeutsch – and dialects is a social distinction, often used for political ends, to the disadvantage of certain social groups; it ain't a linguistic distinction. Grammar is therefore no longer normative, but descriptive: whether a sentence is grammatically correct may depend on the group of people whose language is being studied. "All of the students weren't present." – for different groups this sentence is ambiguous, has only one meaning, or only the other. Of each of the following six sentences it has been claimed that it is ambiguous. Write down the possible meanings. Amongst the examples, can you distinguish two kinds of ambiguity? "This pig is ready to eat." "Don't forget how low Leonard is." "Benjamin told Michael that it would be difficult to shave himself." "They fed her dog biscuits." "I know a taller man than Doug." "At last Algernon has arrived." 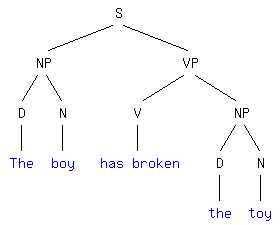 Human speech is not interpreted linearly, as had been assumed (and as computer programs are, line by line, instruction by instruction,) but in terms of 'phrase markers' or 'tree structures', like the one shown on the right for a very simple sentence. Phrase markers are theoretical entities, in the same sense as electrons are: we may never be able to observe them directly, but they constitute essential ingredients in some theory – of grammar, or of atomic structure – and any evidence for that theory confirms our acceptance of these entities. Non-lexical or syntactic, grammatical, amnbiguities can then arise when sentences with different deep structures happen to give rise to the same surface structures. And some observations of require for their explanation the distinction between surface and deep structure. "Norway is less overcrowded than Japan is/ *Japan's." "Complicated though it is/ *it's, the theory makes sense." – the contraction is not allowed if what follows "is" in the deep structure has been (re-)moved. "Joe expects (Michael will go),"
"The soldiers the President honoured had killed innocent peasants." "The soldiers the President the demonstrators hated honoured had killed innocent peasants." "Frank is easy to please." "Frank is eager to please." This consists of rules for re-arranging phrase markers, converting deep structures into the sentences as we speak them. A sentence is grammatical, if thre is a deep structure from which it can be derived by these transformational rules. 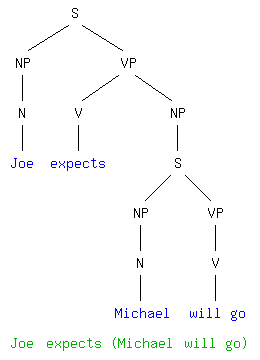 "Joe expects (Michael will go)" → "Joe expects Michael to go." (We can see that "Michael" has been moved to the higher sentence, because we can now put it in the passive: ... → "Michael is expected by Joe to go." "Reggie intends (Reggie will come)" → "Reggie intends to come." "A boy is outside" → "There is a boy outside." Most of these transformations apply in a certain order, from the lowest level upwards, in a kind of cycle, followed by some post-cyclic transformations. "Anthony feared (Bill had seen Charles)"
"Joe expects (Michael will go)" → "Joe expects that Michael will go." "Canadians speak English." → "English is spoken by Canadians." "Two languages are spoken by nobody in this room." – so passivisation may be required for the intended meaning. "Nixon loves Nixon." → "Nixon loves himself." "Only Nixon loves Nixon." / "Only Nixon loves himself." – so reflexivisation may be required for the intended meaning. Children's language acquisition is apparently in the order of transformations, and similarly language deteriorates in the order of transformations. The reason that Dutch, apparently, sounds child-like to an Afrikaans-speaker, and vice versa, is that there are some slight differences in the transformations: so each does not hear certain transformations in the other's speech that they would expect from a fully competent speaker of their own language. Sometimes it is possible to perform something like experiments in linguistics: the phrase "at all", for instance is restricted in its distribution. By considering examples, find a general description of the environments in which it can occur. Apply the transformations specified to the deep structures given, (again in a greatly simplified form,) starting at the lowest level, with the most deeply embedded sentence. "Barry convinced Nancy (Nancy will run)"
"Martha suspected (a boy is outside)"
"Amy thought (Beth believed (Carol irritated Daisy))"
Try to think of another sentence, like the one above, which does not have the same meaning when it is turned into the passive. Having considered, very very roughly, how transformational grammar explains how we construct – and presumably how we understand – sentences, we can now 'zoom out' and view the human linguistic capabiliy in larger contexts. Transformational grammar allows us to formulate linguistic universals, i.e. aspects that are common to all human languages. These had always been sought for in earlier theories. It appears that the shape of the theory – with deep structures generated by simple re-write rules, and surface structures derived from these deep structures by transformations that apply in a cycle from the lowest level up – is (or can be the same) for all languages. The precise form of the deep structure is under-determined in any language: the transformations can be formulated to fit different forms. But considering a variety of languages, one can choose the form that allows for the simplest transformations, and that on present evidence seems to be a verb-first form: V S O. "Sam kissed Sue and her sister." → "* Sue was kissed and her sister by Sam." It is a consequence of the CSC that there cannot be a word in any language that means "blue and". If all human languages have essentially the same structure, this would support Chomsky's innateness hypothesis, according to which human beings are born with the ability to learn a language: what is innate is not the grammar of any particular language, of course, but the general shape of the theory, as described above. This view is called 'rationalism'; the opposite view, that the mind is a tabula rasa (= blank slate) at birth and all knowledge is derived solely from experience, is called 'empiricism'. Children learn a language remarkably quickly, much faster than they would by rote or by conditioning at a stage when they are not capable of organised learning. The operations required to make and understand sentences are very abstract – even adults have difficulties explaining them; and how could children even begin to structure the sequence of sounds that they hear? One need only compare the way children so easily acquire a language with the way in which they have to learn arithemtic to see that different kinds of mechanisms must be involved. Children don't learn language by heart, but can learn from individual instances – a bit like hypothesis testing in science; this suggests that they fit observations into a pre-existing pattern. This innate theory of language may then be a part of a specifically human symbolic capacity. What evidence is there for this? The ability to learn a language seems remarkably uniform, with only minor differences in degree between individuals: it correlates with, but is not dependent on, other aspects of mental functioning. The different languages of the world function similarly, and are of comparable degree of grammatical complexity – there is no 'half-language' spoken anywhere. For instance, even though different languages use very different sounds, the number of distinctions required between all the sounds in one language, like that between 'voiced' consonants ("b, d, g, s") and 'unvoiced' consonants ("p, t, k, z") in English and Japanese, is about the same. All human societies that have ever been found seem to have had not only a language, but also certain other kinds of symbolic systems: something like art, or music, or rituals. That symbolic capacity is presumably indivisable, comes as one 'lump'. The same person may, by different people or by the same person at different times, be called "Mr. Smith", "John" or "Johnny". What each of these these implies about the relationship of that person to the speaker is part of the connotations of the names. Similarly it has political connotations whether one calls a certain country "Burma" or by its now official name "Myanmar".